I went out on a limb this week. A whole week of tacos. Is that wrong? It feel decadent. But also, so very very right. Mostly because the recipes were simple. Who doesn’t love a Stupid Simple Fish Taco or a Spicy Shrimp Taco? 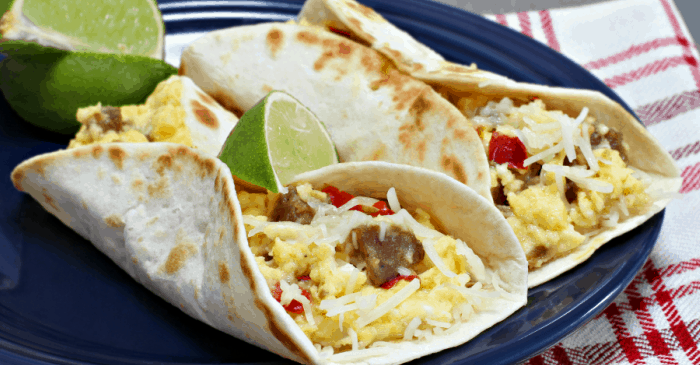 Thus the 3-Ingredient Breakfast Tacos were born. This 3-ingredient naughtiness is just another recipe that’s so simple and easy, it’s ridiculous not to at least try it. And one of my favorite things: It’s a one-pan meal, too. 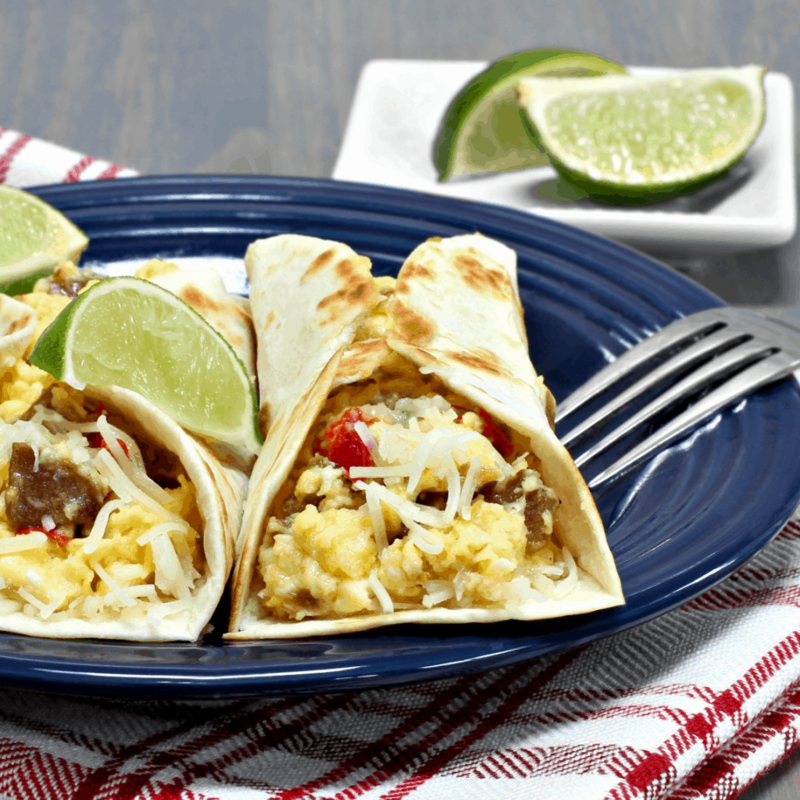 Only one pan to clean when you’re done making these awesome tacos. For real, I can even use paper plates to serve it on, then all I have to clean-up is the kids and the table, and that one pan. Ok. All the fun aside, if this is a recipe you want to make, but aren’t in front of the fridge now scratching your head and trying to decide if you have these ingredients…get your pin on and save this recipe because you’re gonna want it. I will say, theres’ some additional yumminess that could happen here. You could certainly dress up this recipe with more goodies. But there’s really no need. Seriously good breakfast tacos don’t need too awful much dressing up. Because simple is good. And toddlers love good. One bite and you'll be hooked on flavor. But One time of making these and you'll be cooked on the ease of making these at way-too-early-in-the-morning. In a pan over high heat, cook your breakfast sausage. While sausage is cooking, crack eggs and whip with fork, as per usual with scrambled eggs. Once sausage is cooked, remove from heat and allow sausage to cool. Do not pour off the grease. Pour whipped eggs into the hot grease in the pan and return to heat. Break sausage up into small bite-size pieces. 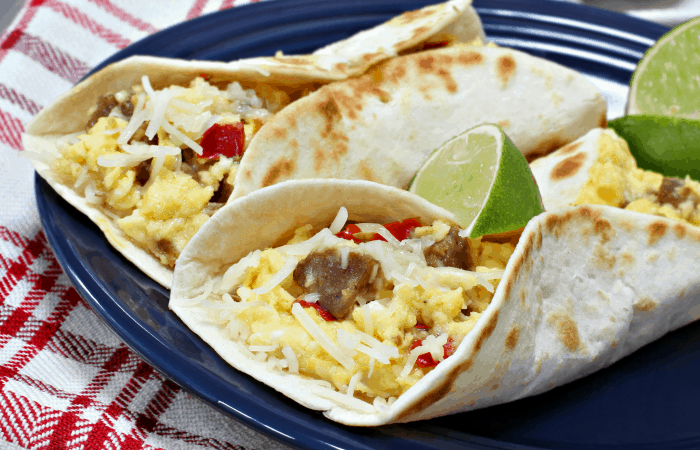 Fill the tortillas with eggs and sausage. Add any extras if you're down.